Volkswagen brought the Tiguan to the compact crossover market back for the 2007 model year, and since then it has been rather successful with more than 2.64 million units sold. At the 2015 Frankfurt Motor Show, the all-new Tiguan was catching eyes like crazy as consumers were waiting for the 2016 Tiguan to hit the market. Highlights of the new model include more aggressive styling outside with a more dominate front fascia, and a slimmed down grille that fills the gap between both headlights. The side profile is more uniform, and overall the Tiguan is actually a bit larger than the outgoing model. Inside, the Tiguan received a digital gauge cluster and new infotainment software that brought Apple CarPlay and Android Auto into the mix. It even comes standard with safety features like City Emergency Braking and Pedestrian Monitoring. Competing against models like the Mazda CX-5 and the Toyota Rav4, the Tiguan makes use of VW’s new MQB platform that is used on models like the 2016 Volkswagen Golf and the 2016 Audi TT, to name a couple. The biggest benefit of the MQB platform is the ability for it to be modified as needed for a specific market. For instance, the U.S and Chinese-spec Tiguans have a longer wheelbase, while European models are just a bit shorter. It seems a little odd in saying it, but the truth is that the Tiguan is rather versatile, and the MQB platform is a perfect fit. 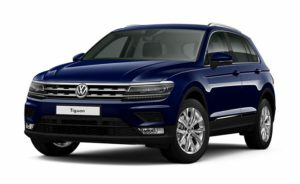 The Tiguan is the first VW product that has been designed on the MQB platform. This is a modular platform and all the upcoming cars/SUVs will be based on it. This will help them to get more flexibility in the near future. In terms of design, the Volkswagen Tiguan does have a lot of styling elements that resemble its siblings. There is a large front grille that gets three horizontal chrome slats and this melds well into the LED headlamps. The headlamps even have daytime running LEDs integrated into them. The dimensions appear to be ore compact than what it is. The SUV is wide and hence it doesn’t seem to be tall. The side profile is much like the other VW SUVs like the Touareg. The silhouette is like that of an SUV and this is what makes it look stylish. The rear somewhat looks different in design when compared to the other bits on the SUV. The Tiguan rear design might take some time to be absorbed by some and we are one of them. The Highline variant comes with 18-inch wheels, while the Comfortline gets 17-inch. The Highline variant even gets LED tail lamps, which aren’t there on the Comfortline. The dashboard has been designed in a user-friendly manner. The steering wheel comes with controls for audio, phone and cruise control and the flat-bottom unit is similar to the wheel on the Polo. The instrument cluster is easy to read and comes with clear dials. The multi-function display is a colour unit and shows detailed information about the car, audio, phone, driving details, etc. You also get a touchscreen infotainment system with Android Auto and Apple CarPlay. The screen is smooth to use and sound quality from the speakers is fantastic. However, the infotainment system shockingly misses out on in-built navigation, especially when the car costs this much. You can use navigation via Android Auto through your phone but it isn’t possible on Apple CarPlay. The panoramic sunroof adds to the airy feel in the already spacious cabin. The subtle LED ambient lighting adds to the feel good factor. The Tiguan gets a 3-zone climate control system that works well and the AC chills the cabin in a jiffy. All round visibility is good and the front and rear parking sensors are super useful. You also get a rearview camera but the resolution didn’t feel crisp and could have definitely been better. What I really loved about the Tiguan are the seats. The front seats are large and very supportive but only the driver’s seat comes with electric adjustment and memory function. The headrests are large and have soft cushioning which feels comfy. At the rear, you get 60:40 split seats. The seats are again large and can be reclined too. Space is very generous and knee room and head space are fantastic. I traveled in the Tiguan for 600 kms over a period of two days and didn’t feel tired at all. The boot capacity is also generous at 615-litres and it can be stuffed with a lot of luggage. VW India has launched the Tiguan with a single diesel engine option, an engine that many will be familiar with from other VW products. Displacing 1968cc and 4-cylinder DOHC configuration, this motor develops 141bhp of power at 4,000rpm and 340Nm of torque between 1,750 and 2,750rpm. Mated to it is VW’s 7-speed DSG gearbox and 4MOTION all-wheel drive system.This four-cylinder motor remains a relatively sweet little unit that delivers torque in a surprisingly linear manner. This is despite the strong midrange surge that comes in at around 2,000rpm and stays on till 3,500rpm post which there is hardly any boost. The ideal way to make quick progress, then, is to upshift early and make the most of the strong midrange. With as many as 340 torques kicking in early, the Tiguan rarely feels hassled under normal driving condition. Its only when you floor it under full load, do you feel the need of extra grunt – it does 0-100kmph in 10.84 seconds and in-gear, hits 20-80kmph and 40-100kmph in 6.69 seconds and 8.75 seconds respectively. In comparison, the cheaper but more powerful Tucson is noticeably quicker flat-out. The Hyundai is also more refined of the two, especially when accelerating hard. The 7-speed DSG, meanwhile, is typically decisive and complements the engine well. The Tiguan gets various drive modes and as one would expect, the gearbox reacts differently as you go through the modes – in Eco, it upshifts quite early and allows the engine to coast off throttle whereas in Sport, it hangs on to lower gears and upshifts at around 4,600rpm. The throttle response, too, is dull in Eco but gets suitably crisp in Sport mode. Lastly, in Normal it remained well behaved in the few moments of stop-start driving we were able to come across during our first drive. The dynamics, as with most VWs, are pretty sorted on the Tiguan too. In fact, it feels like a taller Jetta to drive (albeit a bit lighter on its feet) and that’s a pretty good compliment indeed. The steering isn’t the last word in connectedness, but it feels quick and sharp enough to get the SUV moving around. Body roll too, is decently contained for a tall car, and you don’t mind pushing it just a little bit around corners. But the highlight is the ride quality. Yes, you feel an inherent firmness to the setup, but, thanks to the tall, 55-profile tyres, it rounds off bumps really well, with only the nastiest of them thudding into the cabin. This allows it to cruise really flat and smoothly at high speeds on the expressway, and as a family car on a weekend outing, you’ll really appreciate that. The Tiguan boasts of the 5-star rating in the EuroNCAP crash tests and features six airbags, ABS, traction control or ESC, hill descent and hill hold assist functions. It also features Active Hood for pedestrian safety which raises the bonnet by 3 inches when the car detects an imminent crash with a pedestrian. In addition, the Tiguan also comes with parking sensors at the front and rear, along with a reversing camera as well. Volkswagen Tiguan turns out to be a stellar product with the belligerent pricing and incredible performance. It packs way more features than all of its contemporaries together, while the mileage is also pretty decent. It looks the most complete SUV in the segment and at least, should be given a try before going to purchase the heavyweights like Fortuner, Endeavour and Pajero Sport.